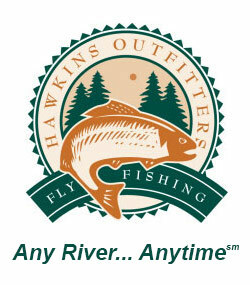 Hawkins Outfitters is one of the larger guide services in Michigan. We fish the Manistee, AuSable and Pere Marquette Rivers and are constantly looking for ways to get our clients hooked up. One on the ways is creating and using unique fly patterns that others don’t have. All of our guide use fly patterns that one of us has created but are not readily available to the public. These flies, after being kept quiet for awhile, are made public at some point. Subsequently we either post them on our website or sell the pattern to Orvis for a royalty. Orvis then produces and sells them. Jon Ray, Ed McCoy, Russ Maddin, Steve Pels and myself, Chuck Hawkins, have all created fly patterns that are go to bugs for the Manistee, Pere Marquette and AuSable Rivers. 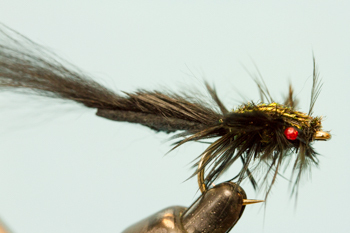 We also use these flies on many smaller rivers, inland lakes and Lake Michigan Bays. When looking at my crew of great guides and tiers I see some similarities and some differences. The similarities, a passion for fishing, inquisitive, fishy minds and a constant awareness of new patterns and fly tying techniques. The differences? Jon Ray and I are into absolute simplicity, ease and speed to produce are important to us. Ed and Russ (two of the best tiers in the state) produce beautiful, complicated flies. Their fly patterns are works of art. 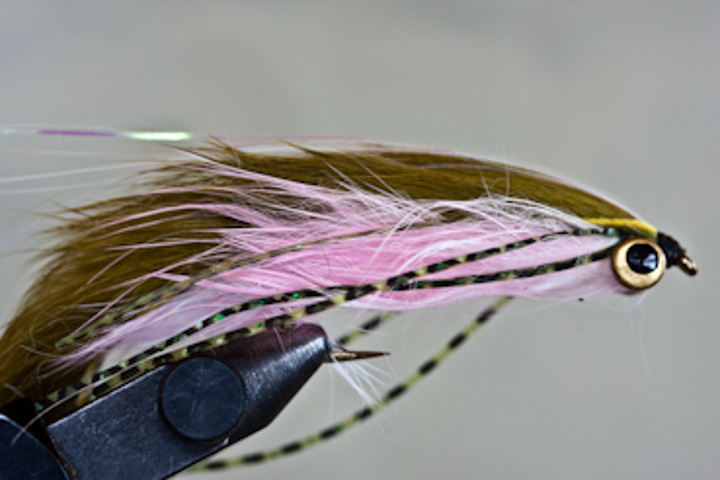 Russ Maddin has created streamer fly patterns that are known far and wide. The Mad Pup and the Circus Peanut are staples in my streamer fly pattern selection. The Circus Peanut has got great movement and can be tied and used successfully in many colors. 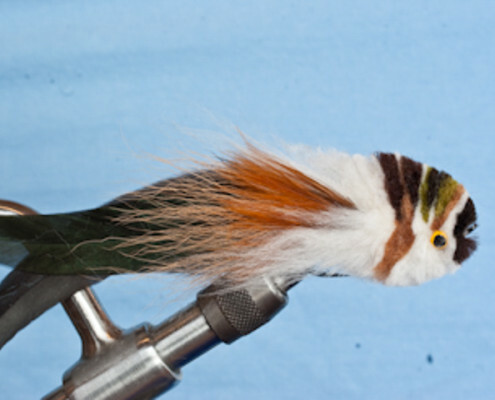 his passion for dry flies and his abilities at the vise. 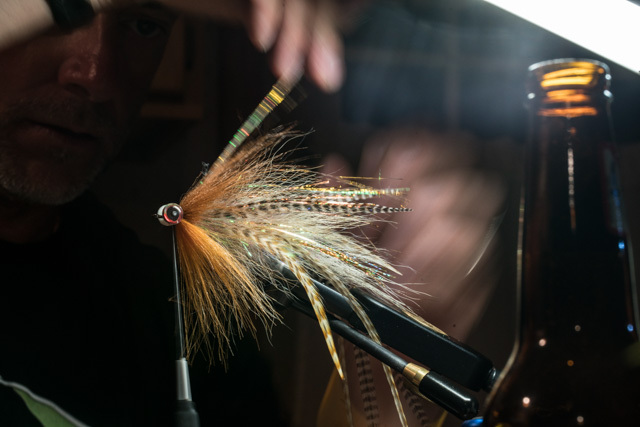 Ed has four fly patterns in the Orvis catalog that he has made public, the AP Spinner and AP Drake parachute flies and two different hex dry fly patterns, the Foam Belly Hex and the Muck Hex. Above all these dry fly patterns successfully imitate most of our June and July hatches. 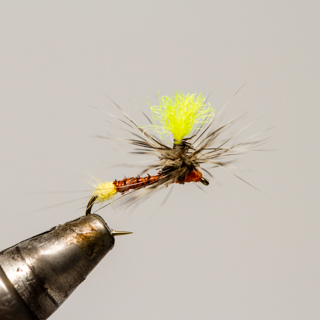 Jon Ray creates fly patterns very quietly. Rarely does he blow his horn and likewise usually doesn’t take credit, but he should. He has several dry fly patterns for trout that I use a lot. They aren’t public yet, maybe soon. In particular the Blue Balls Cricket rocks them in the summer. A couple that he has brought out are the Perch steelhead swing pattern and the F.D.S streamer for smallmouth bass. 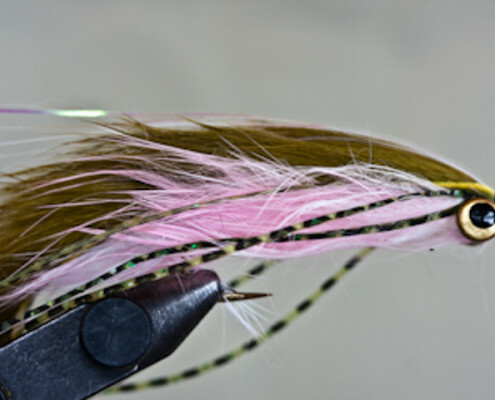 My streamer fly patterns, the Nutcracker, Little Rascal, Hat Trick and the Triple Double were all fly patterns that I created to fill a need. The Little Rascal, a simple strip leech looking streamer was actually developed to represent salmon smolts that were getting devoured by resident trout below Tippy Dam. Above all it has turned out to be deadly. It is used widely in many different sizes and colors. In early trout season the black, olive, and white one gets eaten often as the lamprey hatch out of the mud. 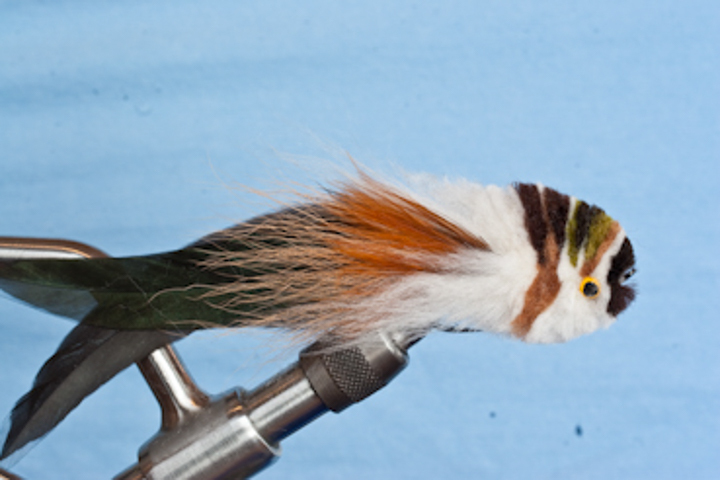 All of my fly patterns were designed to have lots of movement so I incorporate rabbit and marabou in all of my bugs. The Nutcracker, born on the Upper Manistee, looks so lifelike in the water at times trout make fools of themselves over it. I tie it in many more colors than Orvis does. Pancora colors for Argentina and more natural, mottled offerings are a couple of the others I use. Similarly, the same is true of the Hat Trick and the Triple Double. Look at them and tie them in colors that will work on your waters. There are a million fly patterns out there some great a fooling fish and some great at fooling anglers into buying them. You can be sure that Hawkins Guides fly patterns have proven themselves over and over again. Next time you are in the boat with us pay attention to what we tie on your line, odds are that you haven’t seen it since the last time you fished with us.